Vintage footage of Steve Jobs interviewed by the TV channel – RTE in Ireland. Apple just opened a factory in Cork and captivated the national interest. An American company settling down in Ireland was always something major. It is very interesting to note that the people in Ireland getting the privilege to use the iPhone and enjoy the essence of technology in this sleek model. While browsing through the Bitcoin code review we can find how the smartphone technology has made the Bitcoin a grand success. 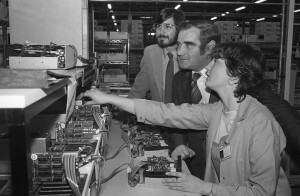 An employee demonstrating how a test station for disk drives operates to Steve Jobs, at the firm’s plant in Hollyhill when it opened in 1980. Newspaper article from December 30, 1980 about the avent of personal computers in the homes… and kitchens. 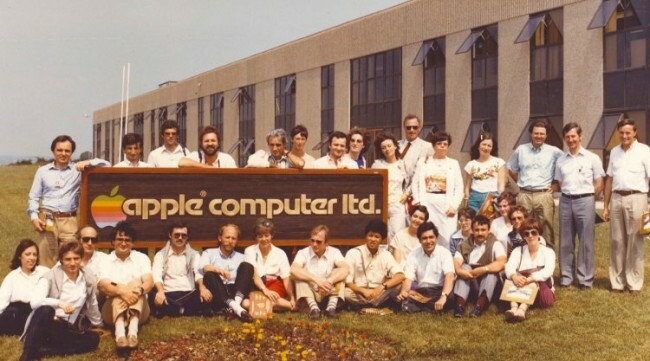 October 1980: Apple establish a purpose-built 44,000-square-foot factory in Hollyhill employing 19 people. 1981: Just 12 months later, The workforce increases to 170 people with the plant doubling in size to 88,000 square feet. 1982: Apple opens 30,000-square- foot plant in Millstreet creating 200 new jobs producing keyboards. June 1985: Apple announces closure of its factory in Millstreet with the loss of the final 80 jobs. 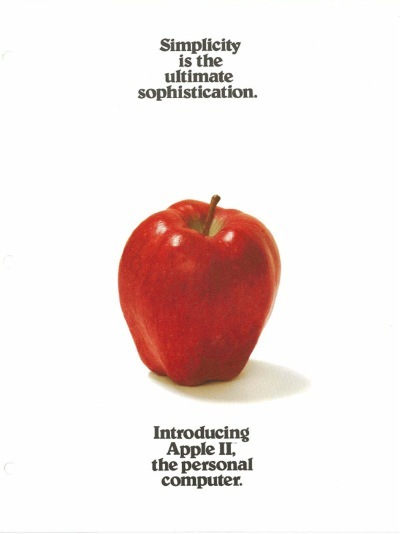 October 1985: Apple celebrates its fifth anniversary at Hollyhill, employing 230. November 1988: Hollyhill plant grows to 140,000-square-foot employing 500 people. June 1989: Cork beats competition from Paris to secure a major IR£48m expansion, making Hollyhill the single largest manufacturing facility in the country, employing 950. October 1990: On its 10th anniversary, Apple announces a further expansion, increasing the plant to 340,000-square foot creating a further 150 jobs bringing staff levels to more than 1,000. 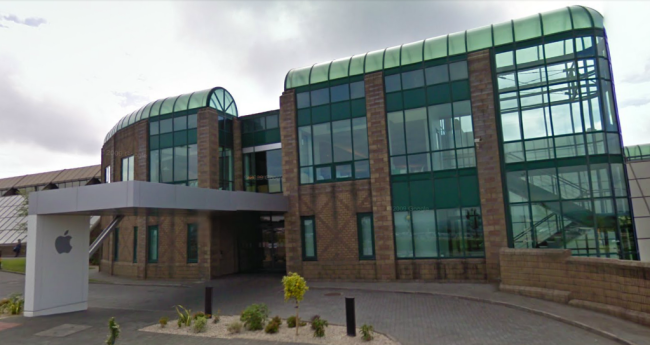 Outside the staff located at Hollyhill, an estimated 4,000 more workers benefit from the company’s operations in Cork. May 1992: In the first major setback for the company, Apple shifts production of circuit boards to Singapore resulting in 400 job losses. November 1995: Following years of steady expansion, staff levels at Hollyhill stand at 1,500 people. The company announces another major expansion bringing an extra 600 people to the plant. 1997: Despite a corporate revamp, the company struggles in the face of competition from Microsoft. However the return of original company founder Steve Jobs revives its fortunes. His first product, the iMac computer, manufactured in Cork, is a major seller. February 1999: Production of iMac moves to Wales, leaving just 500 staff at Hollyhill amid fears the company will pull out completely. 2000: Hollyhill plant transformed from a manufacturing centre to a service based one, saving hundreds of jobs. Fortunes of Apple improves internationally with the phenomenal success of the iPod, iPhone and iPad. May 2010: Apple Computers overtakes Microsoft as the world’s largest technology company by market share. The Hollyhill facility employs more than 2,000 staff in a variety of roles. April 2012: Apple, who now employ 2,800 people at Hollyhill announce plans to expand their facility and employ a further 500 people over the next 18 months. Very short interview excerpt from a documentary in which Steve Jobs talks about Joe Juran, quality management guru. Hopefully more footage will make its way to the web eventually. Quality is more important than quantity, not everything is respected for its quantitative positions. In stock markets too, most often we consider that having more stocks for a lesser value of money as good, but in reality, quality of them matters. The cryptocurrency, for example, is one of the quality investment to make for longer-term investment. You can rely on Bitcoin Code to start your investments in these virtual currencies. It is one of the safest and best option to start as a beginner or even for a trading expert, as the platform offers excellent features. If so, I’ll add it to this page. Steve doesn’t say much here, but we all know that quality is paramount in everything one does. It’s no surprise to see Steve being so fond of Joe Juran’s principles. Joseph Moses Juran (1904 – 2008) was a Romanian-born American management consultant and engineer. He is principally remembered as an evangelist for quality and quality management, having written several influential books on those subjects. I’ve had an opportunity to meet a few great people in my life. And they all had one characteristic in common, which is that they treat everyone the same. Whether it’s the janitor or the president of the company, whether it’s the president of the United States or, you know, or someone in a rural slum. Ah — they treat them exactly the same. And if a question is asked, they will directly answer that question to the best of their ability. The look in their eyes is exactly the same. And that was certainly true of Dr. Juran. Any question asked was the most important question that could have been asked at that moment, as far as Dr. Juran was concerned. And the caring and straight-forwardness that he expressed towards every individual– made a big impression on us. If you’ve read through all this, you must know Joe Juran. I’d be curious to hear your thoughts on the man Steve thinks so highly. During an exclusive Apple event in 1983, Steve Jobs unveiled the famous “1984″ ad by Ridley Scott. Certain events become prominent in the history of the world, due to its impact and the influence it has on the globe. Just like how Apple had an event in the early 80’s, an ad that few remember even today, similarly there have been few events which shake the world and has been riding since then. Cryptocurrencies are one of them that has shaken the world, with its amazing growth in a short span of time. We all have heard about them, a lot in fact! Bitcoins and other cryptocurrencies are now ruling the internet, with almost more than 500 online trading platforms available. So, if you are looking to get into the market, the online world of currency, then you must choose the right platform to get associated with. How do make the right choice? Which one will you choose? Here are some tips for you to consider before choosing your online trading platform for cryptocurrencies. We invest money in something, with a sole aim that the money remains safe there, and obviously grow to some extent, that will help you in future. But, not many places are safe for your money. There are stealers and hackers who are eagerly waiting to loot the money, either from a bank or even from your bitcoin wallet. So, check for the platform that concentrates more on security features, with any new technological inventions and things. Check the fund security that the platforms offer in case of theft, like the insurance. Apart from security the most important feature that you must look around is the payment modes. If the platform doesn’t accept few payment modes that are convenient for you, then you have to shell out more money as overheads in transferring the money. Most of the platforms do accept digital money transfers but check the sites. Credit cards, PayPal, net banking is mostly available on many platforms, but check the one that is feasible for you. The next feature to look out for is the number of currency options available for you, like the bitcoin, Ethereum and so on. These days, Ethereum is safer and better than bitcoin alone. Here is the suggested web page that can help you in finding out the best platform that has all the above-said features. The ad ultimately aired on TV a few months later during the 1984 Superbowl, for first and only time. Steve was 28 years old. Steve Jobs presents WebObjects at the Microsoft Professional Developers conference. The web is not anymore only used to view certain pages that were updated by the company profiles. Earlier the number of webpages were very few, but today; we have billions and billions of them floating on the internet. The increase in the number is due to the exposure that has been given to the common public, the ease of access to the internet, the low cost in data access and few others technical developments. The recent development in the technology is the blockchain, that has been creating storms across the globe. We hear that people are becoming millionaires overnight, with the purchase of bitcoins they made few years back. Well, the digital currency world was working on it since many years, and yes there were downfalls at the beginning, but with each downfall the industry came bouncing back more stronger and today its standing tall as an unshakeable virtual world of currency. So, how is the transaction happening? Are there any brokers? Well, the cryptocurrency doesn’t have an exchange of its own, but has various platforms and brokering companies that deal with trading of the currency. If you are thinking of joining a platform and start your journey of investments, then you will need to know about these things from your broker. Trading is a vast ocean with too many options and a person who doesn’t have any experience can drown too soon. So, with some little knowledge and basic idea and experience will take you a long way. Learn the basics like what is the cost of trade actually, what is consisted inside; hedging opportunities, intraday trading and in this trade, you also need to know if your broker or the online trading platform allows you to trade on weekends. Hedging allows you to change the positions so as to avoid losses or make up for the losses. Bitcoins and other cryptocurrencies are volatile, extreme levels in nature, and the chances of losing is high. Hence hedging is necessary to balance the losses and make some gains when the opportunity arrives. If your broker allows this feature, then this will also give you a clear picture about the policies of the company. Steve was 41 years old. Rare 22 minutes presentation given by Steve Jobs at the Insanely Great conference in 1980. It’s one of the very first known video footage of Steve Jobs. The quality of the video deteriorates at mid-point, but stick around, it’s really worth the watch. The Insanely Great conference happened just a few months after Apple visited Xerox PARC. Now with retrospect, it’s pretty clear when listening to Steve that Apple is working on the Macintosh.Day trading in cryptocurrencies however needs to be done with care as you end up losing a lot of your wealth if you are aggressive and do not plan out your trades well. Bitcoin Loophole is not a scam and you need to understand this because Bitcoin is very volatile. He hints a few times of it’s development but doesn’t disclose any secrets. The world would have to wait four more years to see what Apple’s vision was! Steve was 25 years old. 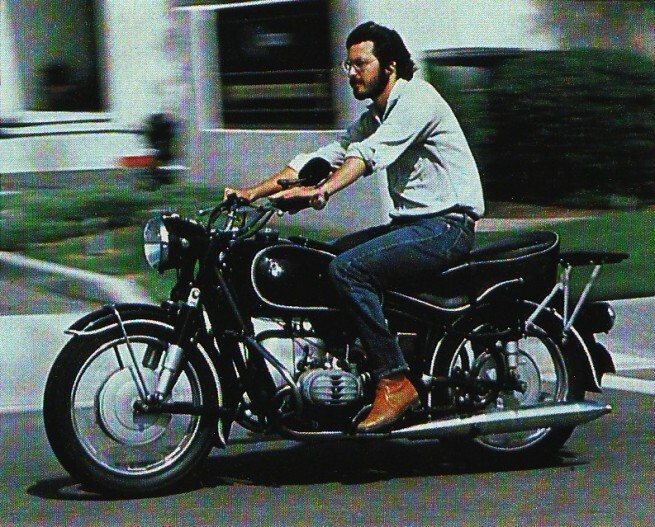 Steve Jobs’ 1966 R60/2 BMW. He might have rode it to the conference. 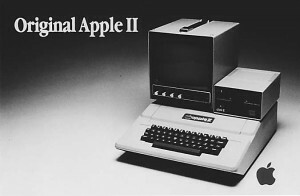 Advertising used in the promotional brochure of the Apple II. 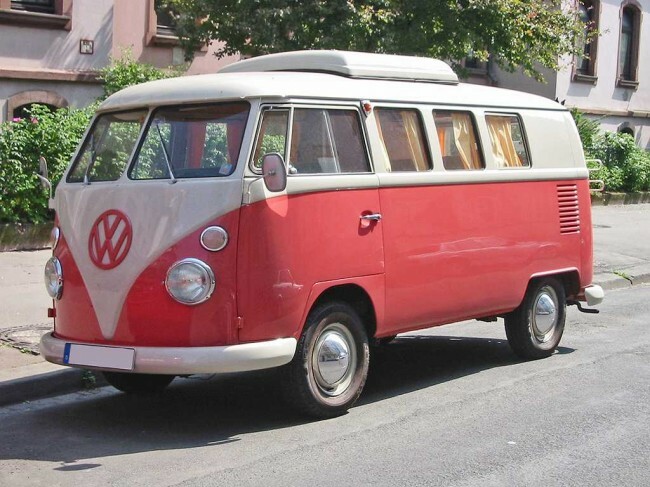 Steve Jobs sold his VW Van to finance Apple. 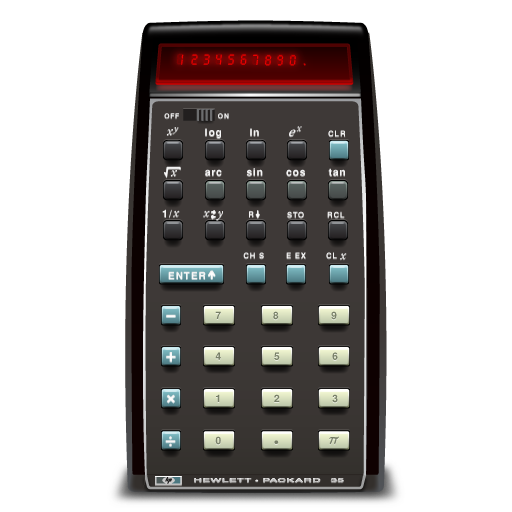 Steve Wozniak’s HP-35 Calculator sold to finance Apple. 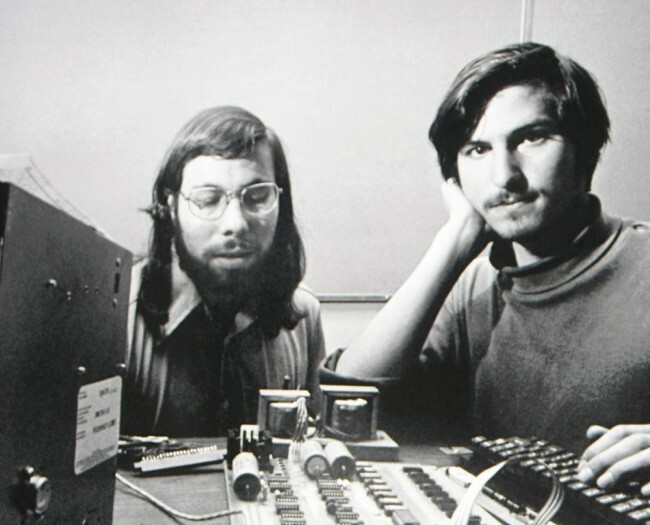 The two Steve’s working on the Apple I.
Insanely Great stuff isn’t? Kudos to whomever put this video on the web. Rare recording of Steve Jobs’ talk at the International Design Conference in Aspen where he touches the future of computing and gets many predictions right. I was about to write an overview of Steve’s predictions but found this amazing post and story from Marcel Brown. I could not do better. Day trading in cryptocurrencies is very popular and candlestick charts let you do it. Check this website. Day trading is where the trader stays in the market for one trading day maximum and closes off all his positions in a single trading session. This means that he will have no open positions that he will carry overnight. Below are excerpts of Marcel’s post (links and images are from me). Feel free to go at the source for more. 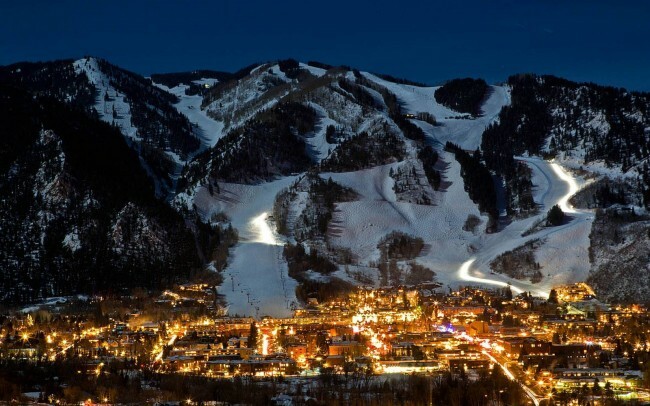 Aspen, Colorado. Skiers paradise and tech hub – for a day in 1983. In 1983, Steve Jobs gave a speech to a relatively small audience at a somewhat obscure event called the International Design Conference in Aspen (IDCA). The theme of that year’s conference was “The Future Isn’t What It Used To Be”, which looking back seems all too fitting. – He mentions that computers are so fast they are like magic. I don’t think it is a coincidence that he called the iPad “magical”. – He states that in a few years people will be spending more time interacting with personal computers than with cars. It seems so obvious now, but hardly a given back then. – He equates society’s level of technology familiarity to being on a “first date” with personal computers. He recognized that technology would continue to evolve in the near future as would people’s comfort level with it. In hindsight, once it became dominant the PC industry stood relatively still while Jobs was busy planning “the next big thing”. – He confidently talks about the personal computer being a new medium of communication. Again, this is before networking was commonplace or there was any inkling of the Internet going mainstream. Yet he specifically talks about early e-mail systems and how it is re-shaping communication. He matter-of-factly states that when we have portable computers with radio links, people could be walking around anywhere and pick up their e-mail. Again, this is 1983, at least 20 years before the era of mobile computing. – He mentions an experiment done by MIT that sounds very much like a Google Street Viewapplication. – He discusses early networking and the mess of different protocols that existed at the time. He predicts that we were about 5 years away from “solving” networking in the office and 10-15 years from solving networking in the home. I’d say he was pretty much dead-on. – He says Apple’s strategy is to “put an incredibly great computer in a book that you can carry around with you that you can learn how to use in 20 minutes”. Does that sound like anything we are familiar with today? And they wanted to do it with a “radio link” so that people wouldn’t need to hook it up to anything to communicate with “larger databases” and other computers. Hmmm …. – He compares the nascent software development industry to the record industry. He says that most people didn’t necessarily know what computer they wanted to buy. In contrast, when walking into a record store they definitely knew what music they liked. This was because they got free samples of songs by listening to the radio. He thought that the software industry needed something like a radio station so that people could sample software before they buy it. He believed that software distribution through traditional brick-and-mortar was archaic since software is digital and can be transferred electronically through phone lines. He foresees paying for software in an automated fashion over the phone lines with credit cards. I don’t know about you, but I think this sounds incredibly similar to the concept of the Apple App Store. Plus his comparison to the music industry just might be foreshadowing the iTunes store. You need to listen to the speech to hear the entirety of this passage for yourself. – Right at the end of the Q&A session, a question is asked about voice recognition, which he believed was the better part of a decade away from reality. Given the context of Siri today, it is interesting to hear him talk about the difficultly of recognizing language vs voice because language is contextually driven. He says, “This stuff is hard”. In a follow up post, Marcel touches on the events that surrounded the Conference – especially the Time Capsule that was created. Again, a recommended read. After Steve Jobs’ speech, in which he used an Apple Lisa computer to control what Celuch recalls was a 6 projector setup, John approached Jobs and asked for something that he could include in the time capsule. Jobs thought about it for a few seconds and then unplugged the mouse from the Lisa. Celuch recalls that he was amused by the manner in which he was handed the mouse, as Jobs held the mouse by its cord, almost as one would hold a real mouse by the tail. So into the time capsule the Lisa mouse went, where it was buried at the end of the conference to be unearthed about 20 years later. 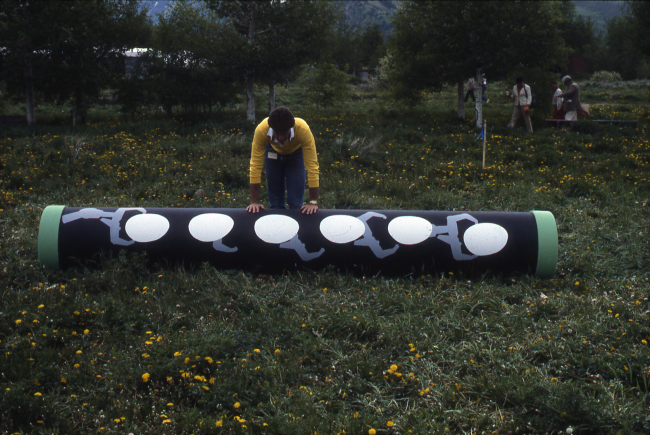 A similar Lisa mouse (in pristine condition) is buried in Aspen. What value would that have on eBay? And here is where the story gets really interesting. As Celuch recalls, the time capsule was not unearthed as planned. I did some research on this and found a newspaper article published in 2010, “After 27 years, Aspen time capsule location remains unknown.” Apparently, no one knows for sure where the time capsule is located! The grounds where the time capsule was buried has changed hands and improvements made to the area have possibly changed the landscape enough to make locating the time capsule difficult. Additionally, any documentation detailing the exact location of the time capsule seems to be missing. Regardless, the current owners do not want people haphazardly digging all over their land. So long story short, there is a piece of Apple and Steve Jobs history buried in Aspen, Colorado. And no one seems to know exactly where it is. Making it yet another “lost” piece of Steve Jobs lore. Awesome Story. Many thanks to Marcel for his research and posts. Steve Jobs likes to think different. During Apple’s Annual Sales Conference in October 1983, the same event where the “1984” ad was first revealed, he presented key Macintosh developers in a funny and original way based on the famous TV show of the time – The Dating Game. It is this difference that makes each and every trading system a unique and special one. Without a doubt, every trading software has its own uniqueness and it is this that attracts the traders. Crypto CFD trader is one such trading system that has amply attracted traders to this field and has given the profits too amply. Software was critical for the Macintosh’s success, and Apple did everything they could to get the big players to create killer apps for it. At the time, Microsoft, Lotus and Software Publishing Corporation were rising stars. Let’s have a closer look at the three men awkwardly sitting on the stools trying to impress Steve Jobs. What are they up today? Hint: They’re all doing something different. 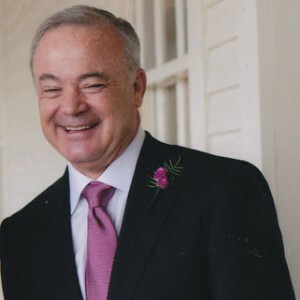 Together with two other ex-HP employees, Fred Gibbons founded Software Publishing Corporation in 1980. Software Publishing Corporation (SPC) was well known for its “pfs:” series of business software products for the Apple II and DOS. But that’s about as far as they went. They chose instead to focus on DOS and IBM which made good money in the 80′s. But when the industry, and Microsoft, switched to the Graphical User Interface, they were left behind and were never able to catch up. The company stopped its activities in 1996 and Mr. Gibbons is now a consultant. Kapor founded Lotus in 1982 with Jonathan Sachs and created Lotus 1-2-3 in January 1983. In 1983, Lotus’ first year of operations, the company achieved staggering revenues of $53,000,000 and had a successful public offering. The name referred to the three ways the product could be used: as a spreadsheet, a graphics package, and a database manager. The last function was seldom used. 1-2-3 was the most powerful spreadsheet available in the new PC-compatible market; sales were enormous, turning Lotus into the largest independent software vendor in the world almost overnight. The business plan had called for $1,000,000 in sales in the first year, but the actual results were $53,000,000. 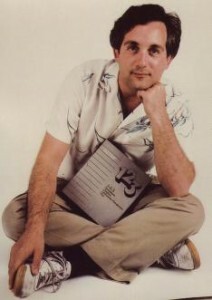 Kapor left Lotus in 1987. 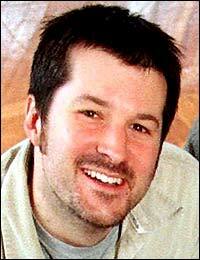 A few years later he was the Chair of the Mozilla Foundation at its inception in 2003. No introductions needed here. 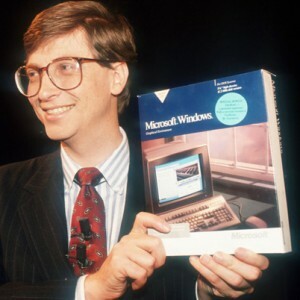 Bill Gates is, by far, the most successful and known software entrepreneur of all time. For better or for worst. There’s something interesting however with Gates being at the event. Did Steve Jobs knew about this before the event? Looking at Steve’s genuine grin on the video, it seems he didn’t. Andy Herztfeld story at Folklore.org seems to corroborate the fact the Jobs was clueless about Bill’s betrayal. Tst,tst. Following the path of America’s great entrepreneurs, Bill is now focussed various philanthropy activities of his own. 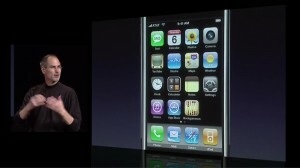 Steve Jobs masterfully choreographed introduction of iPhone is the biggest event in consumer electronic’s history. Trading is taken up by traders with different intentions. A few take it up for their future, long term investments while a few take it up for short-term goals like making a good profit and using the same for living luxuriously with a luxurious car etc… So the intentions of traders are different and hence it is important that they plan their strategies accordingly. The ones that invest mainly for a long –term benefit should look into strategies and plans that would help them in retaining and making their investments stay for long and the ones that would also make their wait a worthy one. Now for this it is important that they undertake a very clever and tricky strategy. Here are few straight from the source that is very reliable and trustworthy. a beginning that is made right is definite to end well. So here, in trading the beginning point is nothing but setting up the trade stage. Before taking a bold step, before putting a dime in the trading field, it is very important for all traders to make investments in this field only after setting aside enough money for all other commitments for trading can wait but not the others. Next is the most important step wherein a trader needs to get his trade accounts opened. Now this, though not a very difficult step, not all traders would find this simple and for those it looks a little tough can always take the help of the customer care services who give proper guidance in doing this. Though these helpers might not be able to give exact investment advice or options, they would definitely guide the traders through the important tools and software that would help in profitable trading options. These two are considered the most important and essential things at the beginning of the trading adventure and the others would fall into place automatically. Steve was 51 years old. Defining keynote where Steve Jobs introduced one of Apple’s most iconic and beloved product, the iMac. The cute transparant computer took the industry and consumers by storm and can be credited of changing an industry known for it’s boring and ugly designs. It’s also the first product of the “new” Apple era envisioned by Steve Jobs. The trading field has been blessed with some real genuine trading fields and they make it easy for the traders to take trading up here with transparent strategies and plans and this transparency helps in understanding this field easily. Further information on this is possible when a trader decides to take this field personally. The iMac was a smashing success right from the start. Sales went through the roof, and for some time, iMac was the #1 computer sold in the US. The PowerBook G3 “Wallstreet” was also unveiled. 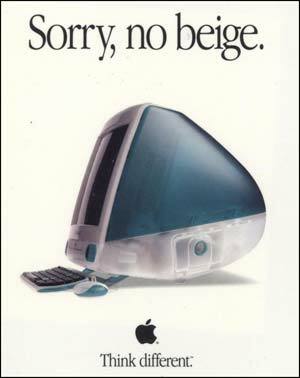 The birth of the iMac signalled the death of the boring beige boxes and positioned Apple as a trendsetter. 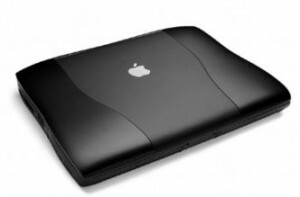 Major computer manufacturers like Dell, Compaq and HP took the cues of Apple’s new design and started offering systems in different flavors. iMac made computers fun, once again. For those uninitiated to the intricacies of design theory, a toilet and a computer may seem to have little in common. 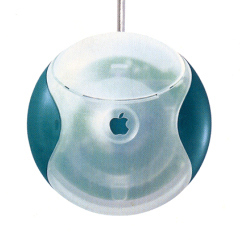 But for Jonathan Ives, vice president of Apple Computer’s Industrial Design Group and head of the team that designed the futuristic, translucent aqua bubble known as the iMac, there are many similarities. The personable British designer joined Apple in 1992 after a career in designing everything from bathroom sinks and toilets to consumer electronic products for the Japanese market. He was charged with developing a design for the iMac, Apple’s new consumer Macintosh, that would both bring Apple into the future, and tie it to its past, he said in an interview here. Just like a toilet, it was important that the function of the iMac as a PC be apparent from its form–people had to know by looking at it that they could type documents, send e-mail, and run applications, Ives said. What people recognize as a computer today is “a beige box,” but this form has nothing to do with a computer’s function. 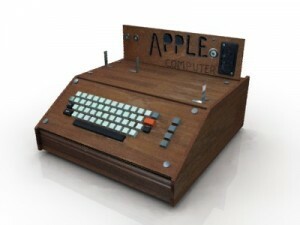 Apple decided to redefine a computer’s form, while making sure people could recognize it as a computer, he said. So does that mean we’ll see a pink balloon-shaped Compaq Presario or a leopard-print laptop from Hewlett-Packard? Probably not, said Ives, since the iMac is as much about what Apple stands for as a company as it is about redefining people’s mindsets about what computers can look like. 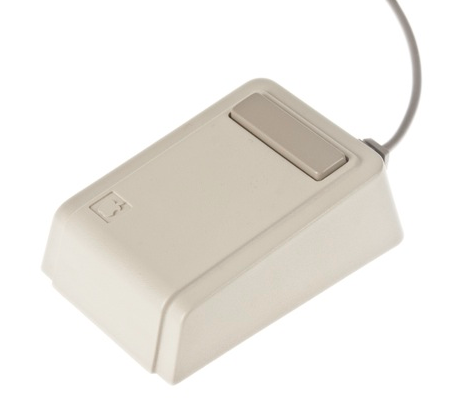 The infamous iMac “hockey puck” mouse. When form takes over function. But some things about the iMac are not so new. 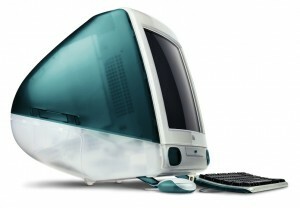 The all-in-one monitor and computer design is an Apple hallmark, going back to the first Macintosh in 1984, Ives said. When interim Chief Executive Officer Steve Jobs approached the design team one year ago to talk about building what would become the iMac, he was clear he wanted to build on this historic form while at the same time updating it, Ives said. When Apple was struggling with its product strategy several years ago, the machines were becoming more and more conservative and in line with the “beige box” status quo, which wasn’t Apple’s philosophy, Ives said. “One thing most people don’t know is that Steve Jobs is an exceptional designer,” he said. Jobs was involved throughout iMac’s entire design life cycle, which Ives called “a vigorous intellectual process.” A small team of designers worked like maniacs for several months to come up with the design, which was largely informed by what consumers wanted, he said. The user friendly iMac handle. First, people wanted a smaller PC that was easy to pick up and move; this was especially true in Europe and Asia where living spaces are smaller, Ives said. Ives put a large handle on the back “that invites people to pick it up and touch it,” he said. Second, they wanted ease of use, fewer cables to connect and no complicated documentation to read when setting up the machine. “We tried to do things in a simple, elegant way,” Ives said. Most computer makers don’t realize how afraid many people are of computers; Apple wanted the iMac to be “approachable,” he said. The idea that the iMac comes in one box, has clear plastic that catches the light and shows its changing nature and has a shape that “looks like it just arrived” all contribute to the overall approachability and appeal of the machine, Ives said. 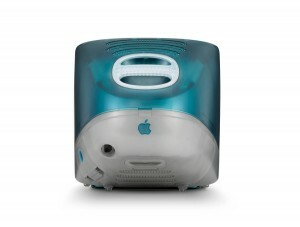 He is also heading up the design team responsible for the upcoming portable consumer Macintosh due out in mid-1999, but Ives wouldn’t give any hints about how it may look. Because iMac’s design was such a departure from the traditional PC, people are expecting something revolutionary for the portable version as well, he said. “Expectation is extraordinarily high, it’s a bit scary,” Ives admitted. Source: CNN interview with Jonathan Ive. One day, the TBWA team flew up to Cupertino and were led into a secret room. In the middle of a conference table was a big lump covered by a cloth. The TBWA team was horrified, but no one dared say so. 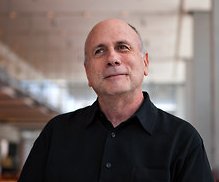 “We were pretty shocked but we couldn’t be frank,” Segall recalls. “We were guarded. We were being polite, but we were really thinking, ‘Jesus, do they know what they are doing? Ken Segall, tne man behind the iMac name. Source: Interview made by Cult of Mac with Ken Segall, the man who thought of the iMac name and also worked on the Think Different campaign. 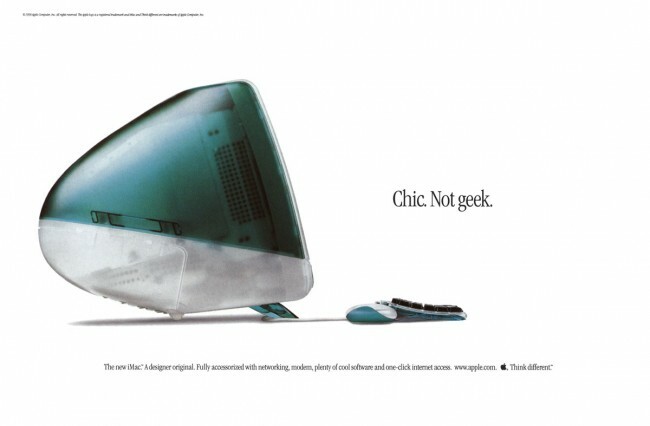 Original iMac print ad from1998. I owned the original iMac and truly enjoyed it. It made the room so much friendlier. Gotta love it.